Pruning is an essential part of garden maintenance; it is necessary to regulate and control growth and to encourage flowering and fruiting on trees and shrubs. It is also one of the most difficult parts of garden maintenance. To prune well, gardeners must have a thorough knowledge and understanding of the attributes, growth, and flowering habits of the plants under their care and of the effects likely to be produced by making the cut. Landscapers, arborists, and home gardeners will find all this and more in Essential Pruning Techniques. Tony Kirkham shares decades of knowledge and expertise in this fully illustrated, comprehensive guide. 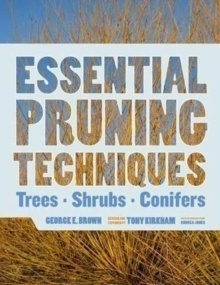 Essential Pruning Techniques offers up- to-date pruning advice for 379 woody plants, step-by-step instruction on the latest techniques and practices, and specific advice for addressing climate challenges. Full colour photographs by Andrea Jones illustrate techniques and show examples of correctly pruned trees and shrubs.